Quilt, Knit, Run, Sew: Happy Mothers Day! Happy Mothers Day to all mothers out there. I have 3 daughters who are mothers. It's a very important job and they are all excellent mothers and I admire them all for that. It just so happens all three are home on Saturday to bring Mothers Day wishes. So we cooked them a nice turkey supper and that means 12 around the table. What fun, we're searching out chairs, stools, benches. We've dug out the wine glasses, and the special cutlery. Since we're heading into the summer season, this will probably our last turkey supper until the fall. "What's for desert?" you might ask. I love it when I get the occasion to use my beautiful trifle dish. It looks like an oversize wine glass. 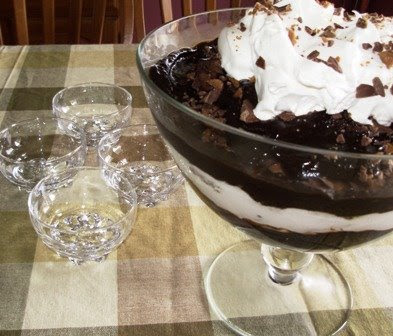 I made my light version of this chocolate trifle from the Kraft Canada website. My trifle looks every bit as good as theirs. Here's a picture of mine. I used chocolate pudding made with skim milk, light chocolate cake made with applesauce instead of oil, and light whipped cream. I used only 2 skor bars instead of 4, so I saved half of those calories. Happy Mothers' Day to you and your 3 daughters and 6 grand kids.... your pretty darn awesome at being a mom and grandmom!